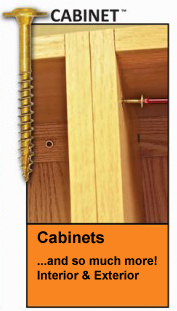 GRK's Cabinet™ screws are designed specifically for use in cabinet construction and installation. Cabinet™ screws are manufactured in a #8 gauge (4 mm) diameter for universal size convenience. These screws are thin enough to prevent most material splitting, while providing sufficient strength to guarantee a secure installation. The washer head design presses flush against any material surface. Builders have discovered that short Cabinet™ screws can sometimes be used in vinyl siding installation, which makes this fastener ideal for both interior and exterior applications. Also can be used for light duty framing applications where a smaller diameter shank is necessary, yet a need exists for drawing power delivered by the washer head.